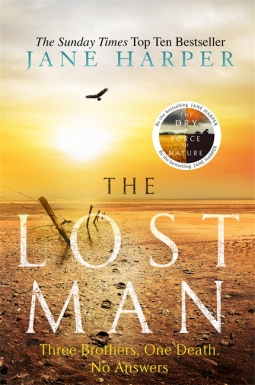 I loved Jane Harper’s debut The Dry and enjoyed her follow up, Force of Nature so I was excited to read her latest stand-alone novel – The Lost Man. I can gladly say that it’s three for three as far as Harper’s books go. The Lost Man is a tense, complex and atmospheric mystery that is fabulously written and brilliantly paced. The first point that has to be made is that, as with her previous work, Harper’s biggest strength is her incredible sense of setting and the attention she devotes to it. She writes in such a visceral way about the often harsh Australian outback, and makes it sound alternately bleak and beautiful. Her writing made me feel like I was actually experiencing the intensity of the Australian heat that the characters were dealing with. The setting also creates a fascinating situation in The Lost Man. This book takes place mostly on a sort of farm owned by one family whose closest neighbours are hours away. This isolation creates an incredibly tense and insular atmosphere that pervades much of this novel. I loved it and couldn’t stop reading until I understood the mystery at play. Another major strength of this book is the numerous intriguing relationships between these people. I found the main character, Nathan, so interesting. He has a relatively simple seeming personality as a bit of a lone wolf of sorts but there is so much going on beneath the surface. This is clear in his relationships with his brothers, mother and with the closest town. I particularly liked the development of the bond between Nathan and his son, Xander. It felt real and added so much warmth to the often pretty dark story. Overall, I enjoyed The Lost Man possibly even more than The Dry which is high on my list of favourite mysteries as it is. There is so much to like about this book from the well constructed plot to the believable and complicated characters. I had no idea how the central mystery would resolve itself and when the explanation came I was blown away by it. The ending was just as good as the meat of the story which is unfortunately not always the case. A definite five star read for me. Click on the cover to be taken to Amazon if you want to buy The Lost Man. As an Amazon Associate I earn from qualifying purchases. Any earnings will go towards books for review purposes! I would so appreciate it. I received an e-arc from Netgalley. My review is my own honest opinion.